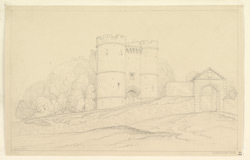 View of the entrance and gatehouse to Carisbrooke Castle. This is the main castle defending the Isle of Wright. It stands on a hilltop, overlooking Newport to the south, on the site of an 11th-century timber fort. Building began on the current castle in 1100 when the island came into the possession of the de Redvers family. This view shows an outer archway with a pediment on and this is Elizabethan. The gatehouse is impressive. The outer part with its round towers were built in c.1335-6 and the towers are heavily machicolated (machicolations were a series of openings under a projecting parapet between the corbels that support it).